As the manufacturer, we are required to do this. We need your original certificate to record the sample impressions on. We process the original with Sacramento and keep a copy on file for 5 years. 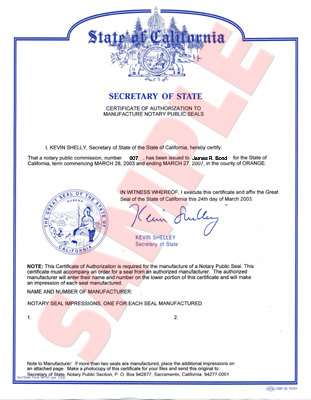 We need your original Certificate of Authorization to Manufacture Notary Public Seal to make a stamp or seal. You may bring it in, mail it in, or FAX a copy to get started and bring the original in when you pick up the stamp. You may order more than one stamp or seal with your certificate, but once processed, you will need a new certificate for any replacement or additional stamp or seal. We recommend ordering two stamps if you rely on having your stamp. Loss, theft or damage such as is often caused by using the wrong ink can leave you without your stamp when you need it most. To make a replacement stamp, we need a NEW Certificate of Authorization which you must get from the folks in Sacramento. This can take weeks! If having your stamp is important, order an extra and keep it in a safe place just in case!